As I walked down the barn to find my sister a new horse, I heard a noise as I walked farther down the aisle. 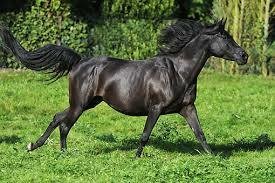 A black horse shied at the sight of me. My mom caught up with me and I asked if I could get a horse too. "Maybe, what horse would you like Sarah," said my mom in a sweet voice. I pointed to the horse I wanted. "Would you want a better horse, I mean that horse is scared of its own shadow?" Said the manager in a convincing voice. "No." I said looking at the frightened horse. My sister came back leading a big bay Thoroughbred stallion. "Samantha, your sister will be getting a horse too," said my mom. The manager went in the black horse's stall and caught her for us, it took a minute to catch her but he did it. We own a small barn and some pastures. I led the horse into a nice airy stall. She was so scared I felt so bad for her. The next morning my sister Samantha was already riding her new horse, on the other hand I was trying to get the halter on my new horse. I finally did. I led her out of the barn and led her down a path near the fields at my house. My sister came cantering past on her horse it scared my horse and she reared and galloped after them, but before she took off I swung onto her back and rode after them. It was amazing. The wind was in my hair. I was riding for a while till I got a hold of her lead rope. I gave it a tug and within seconds I was at a trot. I fell of when she shied at my sister, in seconds she was gone. The next day I went outside to do my chores when I saw her run from the field. She came right up to me. I put the bridle on her swung up on her back, and galloped down the field. I rode her for hours when my sister came on her thoroughbred she named Cobalt. I can't wait for next chapter. Wow!